NEW YORK –– February 21, 2012 – In the wealthiest nation in the world, one in five children live in the shadow of hunger. In a new Food Network produced documentary, HUNGER HITS HOME, audiences will get a first-hand look at the crisis of childhood hunger in America through the eyes of the people on the frontlines of the battle—parents and children, anti-hunger activists, educators and politicians committed to eradicating the problem. HUNGER HITS HOME examines the causes, complications and misconceptions about childhood hunger in the United States and offers a glimpse at some of the innovative solutions being put into practice today. Narrated by Oscar®-winning actor and longtime anti-hunger activist Jeff Bridges, HUNGER HITS HOME is a heart-wrenching, yet empowering hour-long look at one of our nation’s little-known emergencies. 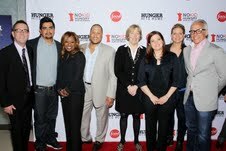 An urgent call to action against this burgeoning crisis, the film is part of an ongoing partnership between Food Network and Share Our Strength, whose No Kid Hungry initiative aims to eradicate child hunger in America by 2015 by surrounding children with nutritious food where they live, learn and play. Every day, more than 16 million children in the U.S. struggle to get enough to eat, and the ongoing economic downturn forces more and more Americans to slip beneath the poverty line. A steady job no longer guarantees a full cupboard and the stigma attached to asking for help persists, leaving already over-stressed parents facing choices they never imagined. And, in the halls of the nation’s capitol, funding cuts threaten existing assistance programs even as the need for them increases. HUNGER HITS HOME goes on a cross-country odyssey from urban New York City and Washington, D.C., to suburban Virginia and Texas’ prosperous Dallas-Fort Worth metroplex, giving viewers a bird’s-eye view of the hunger crisis through the lives of three hardworking families struggling to make ends meet. In Norfolk, Virginia, an ex-military man with four children must take a civilian job for a fraction of his service pay; a single father in Allen, Texas, is on the verge of losing his home and unable to feed his 10-year-old son; a young couple in New York City lack the access to the fresh fruits and vegetables their children desperately need. All of them have discovered that no community is immune to childhood hunger. But HUNGER HITS HOME also offers hope for children in need. The film profiles some of America’s heroes in the continuing fight against childhood hunger, including a determined food pantry founder who makes the battle personal and an elementary school principal who refuses to let his students go hungry. It documents the work of government officials and not-for-profit leaders who will move mountains to mobilize necessary resources. With efforts large and small, these people are helping to fulfill Share Our Strength’s commitment to ending childhood hunger in America by 2015. Each family profiled in HUNGER HITS HOME finds unique solutions to their unique problems, utilizing traditional methods like SNAP (Supplemental Nutrition Assistance Program, better known as food stamps), innovative ideas such as subsidized Community Supported Agriculture baskets for families without access to fresh foods and in-classroom meals that ensure students get a balanced breakfast. But with problems this diverse, anti-hunger activists agree that there is no quick fix to the devastating effects of hunger on American children. They also agree that finding a solution is one of the most critical issues facing Americans today. Food Network and Share Our Strength will host screenings in Chicago, Cincinnati, Dallas, Los Angeles, New York and Washington, D.C. in the coming weeks, offering both an advance look at and discussion on how to take action locally. Food Network presents a Magical Elves production, HUNGER HITS HOME. Directed by Alexandra Lipsitz. Executive Producers: Dan Cutforth, Jane Lipsitz, Alexandra Lipsitz, Kris Lindquist. Producers: Ben Mack, P.J. Davenport and Juan Carlos Saizar. Editors are Austin Flack and Jenn Viola. I don't buy the agenda on this documentary, Mimi - without seeing it so forgive my pre-judgment. I do believe there are FAR TOO MANY kids in the world that go hungry and even starve to death. I just don't buy that it is happening here, to that degree. They used to do the same about breast cancer - lie about the actual numbers which the Am Cancer Association or its like actually admitted - to scare women to get mammograms and check themselves. Good idea - but when you lie once, you can not be trusted. The truth of hunger in the world is sufficient enough for us to care.